Photo copyright Robin Brown, Robin on the right. Robin Brown designs and produces a very successful line of outrageous clothing, with equally stunning price tags. Go see Magnolia Pearl in Fredericksburg on Google or Face Book. Some of the pieces make me feel like a princess and some like a chimney sweep. It runs from silly to beautiful but all of it brings a smile to the wearer as well as to the beholder. 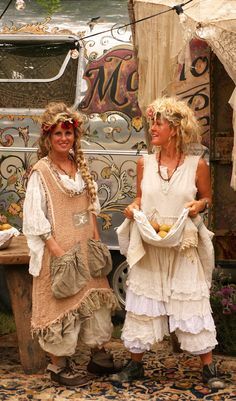 Her clothing is enjoyed nation wide and is all made here in Fredericksburg using unusual fabric, much of it from France, including beautiful linen in greige and sand and neutral creams. I love the few pieces of it that I have in my own closet and it is fun to see it about town, always worn with a dash of elan. Each piece is eye catching and the bold label sewn on the outside makes it unmistakable. Today on Hwy 290 East of Fredericksburg, the winery road, Magnolia Pearl opened its newly expanded retail outlet in a huge three story post and beam barn. It was a fun occasion with people looking at each other as much as at the clothing in the shop. Wine was offered, I had water, and the crepes with peaches were divine! Rebecca Rather reined like the celebrity chef she is, in a well appointed kitchen open for us all to enjoy. It was a lovely party! I added one wonderful sea foam green linen shirt that looks like an artist's smock. Carol Hicks Bolton in the center. Rebecca in the center wielding a spatula. Iced tea and cake served on a screened in porch make a perfect little summer party. Barbara's house was breezy and cool even with the afternoon in the low 80's. She served delicious light treats and flavored tea. The outdoors seems to be part of every room, light airy and open. Beautiful little arrangements everywhere show that this is the home of a talented decorator/collector. Cool light blues speak to the summer of easy soft slow days. I am proud to have one of my paintings tucked high in a cupboard. Cheryl has recently painted a portrait of a dear family pet and it has a prominent place in the house. Barbara's hand as a gardener is evident all around the house, inside and outside, complete with hummingbirds to entertain us. Thank you for such a special afternoon!